Manfrotto's Virtual Reality & Pan Pro Head is an advanced panoramic photography head that's built around the versatile 300N panoramic rotation unit, with sliding plates for nodal point positioning. An elbow bracket allows the camera to be mounted in either portrait or landscape orientation. Precise geared movements of the two sliding plates are used to locate the camera over the panoramic axis of rotation, adding greater accuracy to nodal point positioning. The micro-positioning plates provide extremely precise fingertip adjustment using a gear-drive system. A release button disengages the gear drive for more rapid movement of the plates when it's needed. The plates are also longer than those of the 303 head, which helps to make this head suitable for use with larger traditional or digital SLR cameras equipped with standard or wide angle lenses, or for medium format cameras. Limited 6-Month Warranty, Extendable to 10 Years with Product Registration. Box Dimensions (LxWxH) 13.2 x 11.9 x 8.2"
Virtual Reality & Pan Pro Head is rated 4.7 out of 5 by 3. Rated 5 out of 5 by jagonzalr from Awesome product At the beginning is a little bit confusing on how to use it. I'm from Mxico and tried to read the instructions in Spanish but it was simply awful, so a switch to English. It wasn't that much clear anyway, but the drawings were the key to understand the initial configuration. I have make several photographs now and I have to say that I'm completely satisfied and happy with this purchase. Normally it costs $ but I bought it for only $, awesome deal. If you are a passionate photographer and like to take pictures of nature or places that are open this product is amazing and get the job done. Rated 4 out of 5 by NiteCritr from Easier To Use Than It Looks Taking the pan head out of the box, I was a little intimidated at first as it seemed way more complicated than I thought it should be. It helped to read the instructions a couple of times as well as finding a how to on nodal point positioning on the Manfrotto website. Once I understood the concept, using the pan head was easy. I'm also happy with my practice runs on panoramic photography. Rated 5 out of 5 by Mike A. from Amazing PanHead! This puppy allows for complete control when shooting pano images. Professional. Precise. Efficient. I would like to use a 300ml lens on a Nikon 7200. Will the slides accommodate that lens? This head is large enough for the 7200. Since the head is meant for wide to medium lenses, use with a 300mm is not known at this time. It has been reported that if the camera and lens is 11.02 pounds or less, this head can accommodate it. What is the difference between this bracket and the Manfrotto MH057A5 Virtual Reality and Panoramic Head? How much heavier is the Virtual Reality and Pan Pro head? Will either work with a Pentax 645z (it has a bigger and squarer body than a dslr)? When does the instant savings go off? The Manfrotto MH057A5 has a higher working height. The Virtual Reality and Pan Pro Head is about 4 pounds heavier than the MH057A5 head. Either one will be compatible with the Pentax 645Z. We only have access to current day pricing, as our prices are subject to change at any time without notice. I see no information anywhere on how to use this item, including on you tube. I like manfrotto products, but what advantage do I have with this pan head? Is it easy or harder to use compaired to the Ninja pan heads that many seem to like. There are no reviews on this. Where can I go to get a review? The Manfrotto Virtual Reality and Pan Pro head has a higher weight capacity, as well as a more precise range of movement due to the two axes essentially being two macro rails, which allows you to adjust your settings to the millimeter. 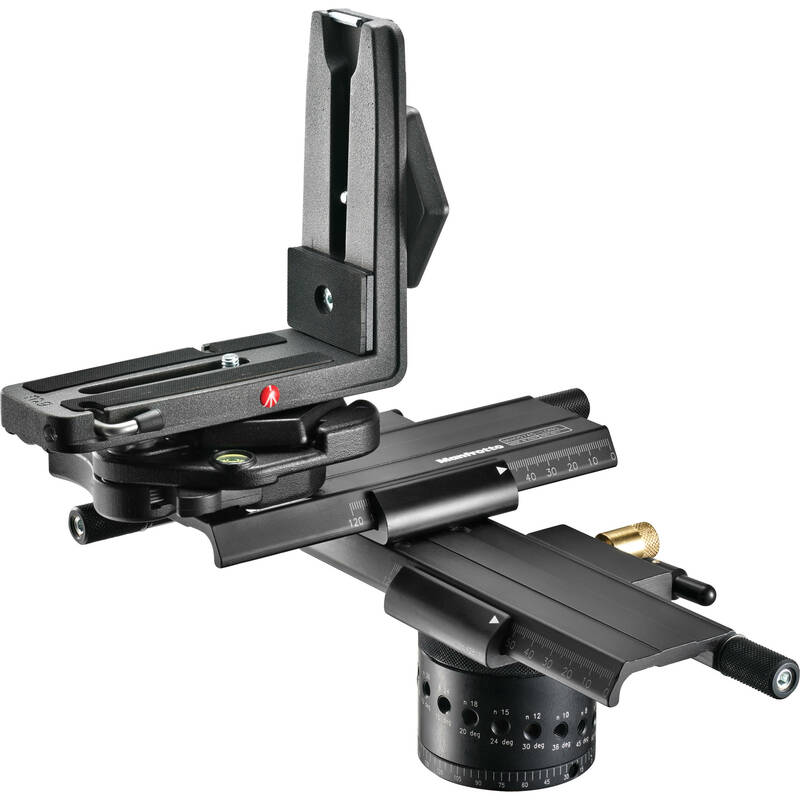 This head will require the use of Manfrotto's proprietary L plate, wheras Nodal Ninja is smaller and lighter and is not as precise, and will accept Arca plates. Unfortunately, no customers have reviewed this head on our website at the current time. What cameras are supported? What additional parts do I have to purchase? You could use the Manfrotto Virtual Reality &amp; Pan Pro Head with any camera up to a medium format camera that weighs 11.02 lbs or less with a lens. Other than a set of legs, you wouldnt need an additional item to use this set-up. Will this work with a canon 5d mark111? It positively works with a Canon EOS 5D Mark III, as this also my camera, it definitely is large enough and stable enough. I even use it with the battery grip attached to the body, which I found makes it more comfortable when switching from portrait to landscape and back, as it keeps the weight similarly balanced in both ways. can it tilt? up and dow?